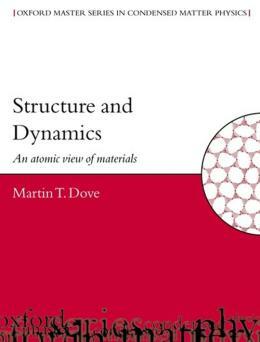 Structure and Dynamics covers the wide range of general principles that govern the behavior of atoms in solids and applies them to the full range of material types known to man. It focuese on the structure of materials at an atomic level and how theatoms vibrate inside solids, bringing these topics together to explore how the atomic principles determine the behavior and properties of materials. Topics discussed include the factors and reciprocal space, the types of atomic bonding, the formalism of atomic vibrations and the theories of phase transitions. The tools of diffraction and spectroscopy in both laboratory and large scale facilities are also covered.